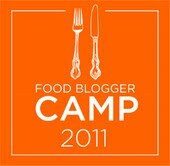 For some (unsurprising) reason, I get the impression that "Food Blogger Camp" beats every other kind of camp out there -- band and science included. This year, food bloggers from around the world will gather in Riviera Maya, Mehico to nosh on fresh seafood prepared Mexican-style, drink free-flowing margaritas, and bask in the beautiful scenery. Sounds like a piece of heaven on earth, no? The best part would be to be in the company of many brilliant, inspiring bloggers, including Mr. David himself.